New York, NY – When people think of great rock voices, Steve Perry from Journey and Freddie Mercury from Queen are some of the names that come to mind. Take their vocal styles; add to them the sublime sounds of great operatic composers such as Puccini and Verdi, and a completely new and original musical form is born. 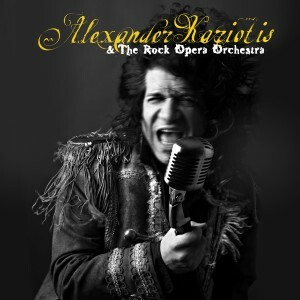 Blending his two loves, rock and opera, Alexander Kariotis is thrilled to be bringing a new genre to the music scene, “There’s room for both rock and opera, even in the same song.” This phenomenal singer does just that; switching from smooth, dramatic Italian vocals with a full orchestra, to gritty rock vocals with searing guitar riffs. Kariotis is not one to set limits, which he proves throughout his debut album, Alexander Kariotis and the Rock Opera Orchestra (VMG – SONY/Red), to be released in February 2014. Included in this debut release are two bonus collaboration tracks. The iconic jazz saxophonist David Sanborn joins Alexander in a beautiful jazz/opera fusion song called Ho Bisogno Di Te. Darryl “DMC” McDaniels from the super rap group RUN DMC joins Alexander in a hip hop/opera collaboration of a remix of Alexander’s original composition called Vesti la Giubba – Hide the tears. Kariotis has an incredible story that he shares within his music. Growing up in Chicago, he quickly found his escape through music and was inspired by his older brother, Tony, the front man of Gambler (EMI Records). When they played locally, the younger Kariotis’ band, The Nodes, got the opportunity to open for them. Only 13 years old at the time, Kariotis thought he was meant to be a rocker, but his brother had another path in mind for him. Tony’s instincts were proven correct when he took Alexander to see Opera star Luciano Pavarotti in concert, and saw how fascinated he became with Pavarotti’s voice. Conflicted, Kariotis now had an immense passion for both rock and opera. Determined to excel in classical music, he began studying at the prestigious Mannes Conservatory of Music in New York with Metropolitan Opera tenor Dan Marek, and coaching with Pavarotti’s coach and accompanist, John Wustman. After moving to Berlin, Germany, Alexander traveled to Modena, Italy, to study with Pavarotti’s voice teacher, Arrigo Pola, and with La Scala tenor Gianni Raimondi in Bologna. From there he perform alongside Tony Award winning actress Elizabeth Ashley in Terrence McNally’s Master Class, had a starring role in the one-man Off-Broadway show, Holdin’ On, sang at New York’s Avery Fischer Hall, the Berlin Philharmonic in Germany, and received his Masters in Opera from Northwestern. Kariotis’ success was shattered when his brother Tony, the person who had brought music into his life, was diagnosed with Lou Gehrig’s disease (ALS). After his brother’s death, Alexander finally realized that he needed to achieve both of their dreams by combining their passions and becoming a rock - opera artist. "When I am singing in both genres, I feel my brother Tony there with me. Although I miss him terribly, I am comforted by the fact that I know he is with me on every track of this album."